In 1950 The Kryder Company occupied 2025 St. Joe and Room 309 Standard Building(aka 215 E Berry St rm 309) as did Moss Engineering Hotel/Motel Builders,Judge Walter E. Helmke, and 1966 County Prosecutor/ 1970 state senator Walter P. Helmke. In 1975 Room 309 was also Lincoln Management Corporation,Inc. 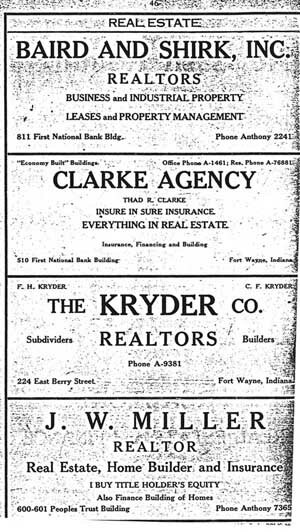 A major complication was thrust on the Probate of the Kryder Estate when while Walter P. Helmke was state senator, God knows how many thousands of Indiana corporation records permanently vanished from the state buildings in Indianapolis. There are various pictures in circulation which the Kryders' granddaughter and Personal Representative finds too repulsive to re-publish, but are readily obtainable in news archives, of Walter P. Helmke standing around with Ian M. Rolland (a president of Lincoln National Corporation) and a Loomis. In 1977 when Rolland became president, so did Frank Kryder's shirt tail cousin, K. W. Maxfield, of counsel in the Fort Wayne law firm Beers, Mallers, Backs, and Salin (Salin who was Indiana Secretary of State while Helmke was senator and now is Salin Bank), became president of North American Van Lines. And Dr. Kenneth D. Kiester's plane crashed near Fletcher, North Carolina in what may or may not have been an accident. The Personal Representative, who had never been in Fort Wayne prior to 1994, was shocked to find the Kryders and their enterprises had been "Marked" in 1941. The Personal Representative is developing a theory that these follow up marks may have something to do with the way LeVonne Kryder obtained an uncontested divorce from Frank H. Kryder in 1941, asking for no child support or property settlement, while there remained the matter of 550 Lots in Fairfield Terrace Section B that had her name on them. These marks were not made by the Personal Representative in 1994, and paper chromatography could be used to prove that.